Vicki ,that blood orange olive oil sounds wonderful ! I have yet to make biscotti though I’ve bookmarked several recipes already 😀 Your biscotti looks delicious ! Love the festive cranberry and pistachio combo ! 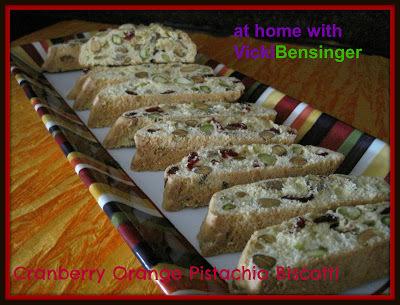 Oh biscotti is so delicious and perfect with coffee or tea in the morning. You really should try it. It’s not difficult to make at all but does require a few steps. It is perfect for the holidays or anytime. What did you mean when you said “if I could share.” Of course you can! They are PERFECT! Blood orange olive oil sounds really interesting. Blood Orange Olive Oil is delicious. I could drink it on it’s own, add to salads, put on fish or whatever you like with orange. You could even use Lemon Olive Oil and Lemon zest with these and it would taste wonderful. I like pairing the cranberries with the orange, it seems like a perfect marriage. If you have never tried it you should order some. It’s delicious! I’m hoping I can pick up some blood orange olive oil at the little spice shop that’s not too far from here. 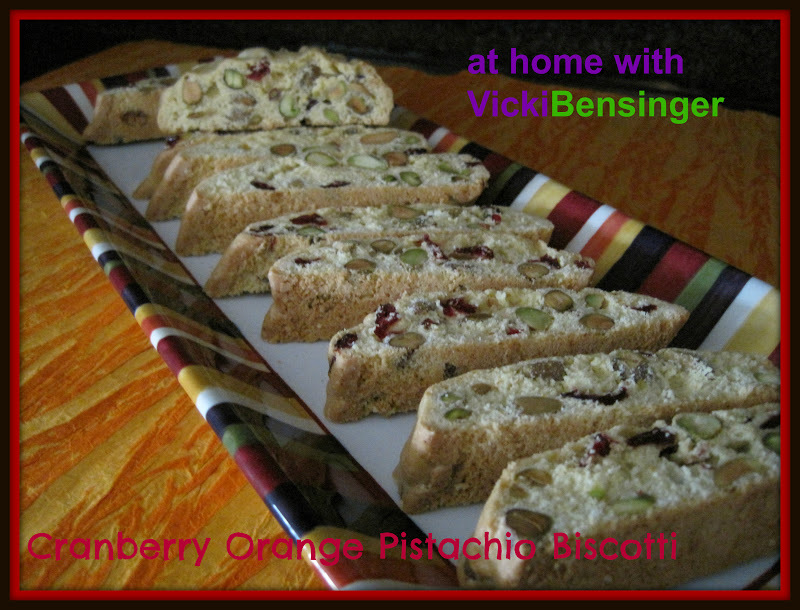 Your biscotti sound phenomenal…and would make amazing gifts!!! If not you can order them online at DiOlivas but I would think there’s a store nearby that would carry it. These look SO good and I can’t wait to make them!! That blood orange olive oil sounds very interesting. Great recipe! I’ve made this recipe for years but decided this time instead of using regular olive oil I’d try the blood orange and it made a huge difference in the taste – even my daughter noticed. I would bet they have some. 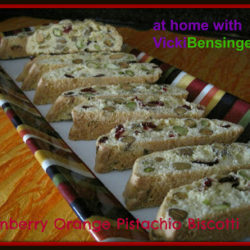 I was just thinking of making more biscotti so what perfect timing! I’ll have to see if our olive oil and vinegar specialty store carries a blood orange oil because I’m already in love with the sound of these. If you try them let me know what you think. I’m sure you’ll love them. I think I’ll make another batch to have on hand Thanksgiving weekend. Sounds great! I’ll definitely remember that. The olive oil sounds really interesting. I should see if Charlotte has that kind of interesting olive oil store. Thanks for a good biscotti recipe. I made one two years ago and have not tried since then. Pistachio is especially loved in this house, so I am sure it will be gone quickly! I think you’ll like them. You can always change up the recipe by adding different nuts, dried fruit and even various flavored olive oils. Now I’ll have to come up with another variation. Hi Vicki! I can see you are pretty busy with your Biscotti. 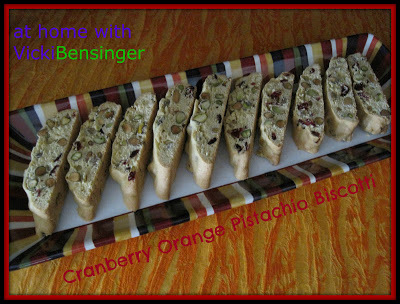 I wish I could make this now, we don’t get cranberries here, I do have pistachios (of course, its essential!). You know, your little present parcel reminds me of st.nickolas day, which is on the 6th. Usualy we give and get bags like that stuffed with oranges, st.nickolas chocolates, biscotti sometimes as well and other sweets. I can’t believe you don’t get cranberries. I’d be happy to send some dried ones to you but my guess would be that it’s not allowed to send food. If so, I’d be happy to. So funny that my packaging reminded you of your little goodie bags. It must be the wrapping paper behind the bag. Beautiful and so festive Vicki! I love your orange additions, what a wonderful flavor combination with the cranberries and pistachios! Thank you. I hope you try them, they’re delicious! Lovely biscotti. Perfect with my morning tea! Oh I agree and even perfect with coffee. No matter how full I am after a meal, I always have room for a biscotti. Your recipe sounds terrific. Thank you for your comment and for stopping by. This sounds like a wonderful recipe, and so pretty as a Christmas cookie. I know they’re so festive and yummy! Back to answer you about the twine around the brie. I kept it on just for the look when I served it. Once the pastry has cooled a bit, I think it would be safe to remove it…it’s pretty sturdy. Good to know, it was so pretty! Blood orange olive oil! what wonderful flavorings!! I’ve never made biscotti – it’s time I tried and this is just the recipe for it!! OMG you definitely need to try and make some. It’s so simple and they’re so good. Perfect with your morning coffee or tea! If you can’t find any you can go online to DiOlivas, they can ship it to you. I’ve never had blood orange olive oil. I’ll definitely have to check out DiOlivas – the stuff sounds delish. And your biscotti looks to be out of this world. Good stuff – thanks. I just found your blog and love it! I, too, just made cranberry and pistachio biscotti, but added white chocolate! I used to live and work in St. Louis in the 70’s and loved it so much! Now following you!